In celebration of Roald Dahl Day, we are delighted to be a part of Roald Dahl’s Heroes! 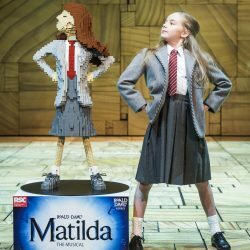 A giant LEGO® brick build of our little genius, Matilda, will be located in the foyer of the Cambridge Theatre in London. 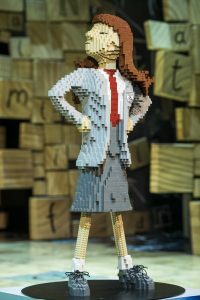 The LEGO® build was officially unveiled on Roald Dahl Day on the 13th September, she is composed of 8900 bricks and took 48 hours to construct. One of our West End Matilda’s Emma Moore welcomed the statue into the Cambridge Theatre along with RSC Artistic Director Gregory Doran and Executive Director Catherine Mallyon. Make sure to share your photos when you visit the Cambridge Theatre using #LegoMatilda and #RoaldDahlDay. To find out more about Roald Dahl’s Heroes including the other characters appearing around the country, visit the Roald Dahl website.